It isn’t often that an MGM musical misses, but in the case of Billy Rose’s Jumbo the arrow flies well wide of the mark. Based on the 1935 play of the same name, it is said that the old Broadway showman, in a fit of ego, insisted that the filmed version — produced some twenty-five years later — use the complete title. It’s clear that as nostalgic as the final product actually is, MGM must have conceded grudgingly — it’s a terrible title. The 1962 film employs that peculiar sixties casting strategy of pairing two younger stars with two older stars in order to appease multiple generations of movie-goers. Forties icons Jimmy Durante and Martha Raye appear as the proprietors of the Wonder Circus, a small outfit constantly on the verge of falling apart. Durante’s Pop Wonder is always finding ways to make do as the better acts flee for circus jobs that — ahem — actually pay a salary. Doris Day plays Pop’s daughter Kitty. She’s a clever girl who knows the angles, and is always scrambling to keep the circus wheels turning, especially on those occasions that Pop loses the night’s take at the craps table. Day’s part was originally intended for Debbie Reynolds, and certainly Jumbo would be a different film with her in the lead. Day in Calamity Jane aside, the more athletic Reynolds always did better in those “regular folks” sorts of parts (The Unsinkable Molly Brown, The Mating Game) than Day, who almost seems like she’s slogging her way through this picture in an attempt to avoid getting dirty. Regardless, Doris isn’t the film’s problem. That honor belongs to Stephen Boyd, of Ben-Hur and The Oscar fame. Why Boyd was cast as love interest Sam Noble is a mystery; the sixties answer to Dana Andrews is far too intense and not nearly talented enough musically to make a go of it. He and Day are jigsaw pieces from different puzzles — they’re just not compatible. Why put America’s sweetheart next to an actor who’s entire screen persona can be summed up in one word: brooding? 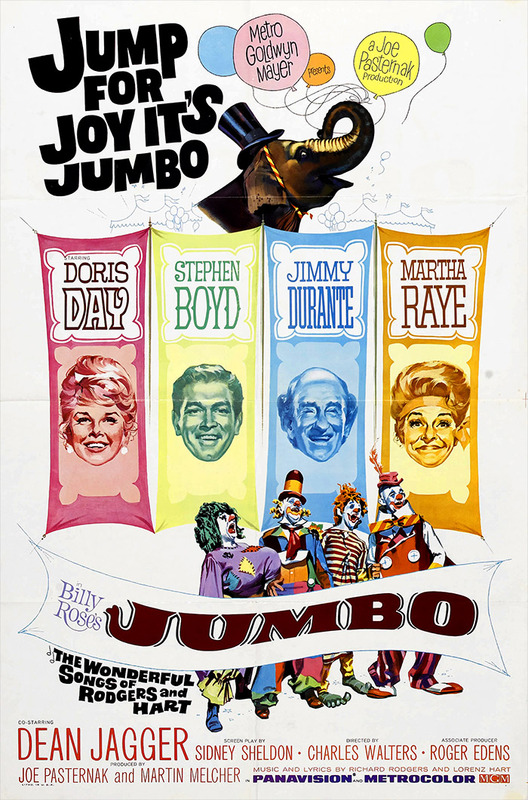 Jumbo, in any case, refers to the star attraction of the Wonder Circus, a versatile elephant at the center of many of the film’s production numbers. The Rodgers and Hart songs are good enough, but something here just doesn’t feel right: by 1962 the notion of characters slipping from conversation into song doesn’t come across the same way it did in the previous decade, even if we are in the realm of period subject matter. (For further proof of this, check out the Disney film The Happiest Millionaire — and it comes in at nearly three hours). Fred Astaire could do it and it was charming, but in the wake of West Side Story the musical had changed, and these abrupt segues to melody became rather difficult to swallow. At any rate, the story revolves around the hostile takeover of the Wonder Circus, and Jumbo in particular, by John Noble (Dean Jagger), who has been secretly purchasing all of Pop’s debt from a veritable army of creditors. And guess what? Noble is also Sam’s father, which leads to a pedestrian sequence of romantic complications between Boyd and Day, that resolve predictably by film’s end. You can practically predict the dialogue. Watch this if you are a die-hard fan or Doris Day or the music of Rodgers and Hart, or even nostalgic for Durante and Ray. With a running time in excess of two hours, those looking to pass the time should try elsewhere. Believe me, Debbie Reynolds never improved any movie she was ever in! Unsinkable Molly Brown? One of the worst movies ever made, thanks to her. Day was a much better singer and actor. Was was Reynolds ever in a good movie? Don't say singing in the Rain cos she didn't bring anything to that movie, she just played "the girl" - coulda been anybody going along for the ride with Gene Kelly. Her biggest accomplishment in life was being the only person in history able to talk non-stop about a divorce for over 50 years! She's still doing it and her poor ex has been dead since 2010! The epitome of talentless. No, wouldn't have helped this movie a bit. Nope. Nein. Nyet.